Staring off the WEN 4276 bench grinder is small at only 16 pounds and total dimensions of 14x10x15 inches. This means it can fit on nearly any bench without any problems. Even though it is small however it still has a solid motor in the housing. The motor in this little bench grinder is 2.1 amps which if you read more bench grinder reviews you will find is a pretty standard size for 6 inch grinders. The motor allows the wheels to spin at 3450 rpm under no load which is plenty quick enough to work on drill bits or mower blades, and even fast enough that you can remove material on wood quickly. 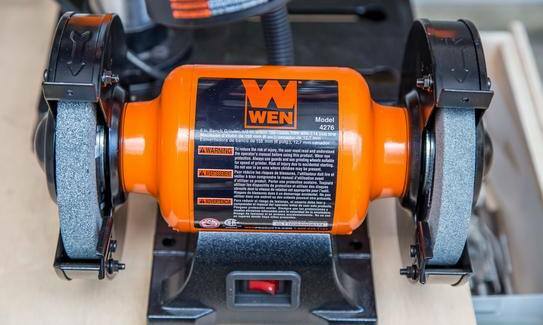 The WEN bench grinder comes with the standard 36 grit and 60 grit wheels and they measure six inches by three fourths inches. The arbors are a half an inch which is a good size to help keep the wheels on. The motor housing is quality metal and the cast iron base is strong to help keep the table grinder anchored solidly to your bench. Changing the wheels on this grinder isn’t a challenge either. The eye guards and housings were designed to be easily removable so you can change your wheels quickly, but they still provide maximum protection so stray material does not end up in your face. The tool rest on the WEN 4276 Bench Grinder are adjustable which is great for making it easy to work on many different things. It helps you get the tool in the right position so you can easily grind on it without damaging it or getting tired. Another top aspect of this bench grinder is it comes with a flexible light to help make your work easier. While a light attachment isn’t an uncommon feature for bench grinders to be able to get one in this price range is a nice little bonus. While the light may not be LEDs or as nice as some others it still works well and any extra light to help you see what you are grinding on is useful light. One question you may have though is what if I don’t have a work bench, but still want a bench grinder? Well, this particular model has a pedestal that you can buy to go with it. This is an added cost, but it can allow you to get a bench grinder without having a bench and it is also cost a lot less than a bench. Another perk of mounting the grinder to the pedestal is it makes it easy to move it around. If you work on location a lot, but still want a mobile unit, then you might want to consider going this route. So, reading bench grinder reviews can be helpful, especially for finding out the features of a particular bench grinder, but the most useful information is what real customers think about it. Currently this table grinder has excellent reviews over all. The star rating on Amazon is 4.3 and that is with over 300 reviews meaning that the majority like this grinder. One of the main aspects they point out about this grinder is the price. It is one of the most affordable on the market, but still packs decent grinding abilities. You can work on mower blades, and small tools without any problems. Many people comment on easy setup is, which is really good especially if this is your first bench grinder. The motor also spins up quickly to get the wheels at full speed and the motor is quite. The fact that it is quite is nice if you work in a small garage in a subdivision or along those lines. Also, the grinder functions well and there is not a lot of vibration. For being smaller sized and weight vibration might be a concern, but when mounted properly the cast iron base does a great job of keeping it anchored to the table. The motor housing is made well also so this bench grinder is durable and will last for years. Some complaints on this grinder though is the wheels it comes with aren’t the best. They can be out of round which causes them to wobble, and they also don’t have the best grit surface causing a lot of heat and stress on the motor. Also, this bench grinder isn’t meant for really heavy work. Some people have complained about the motor bogging down and dying, but that could be from improper use. If used properly this bench grinder is great for the price.